Fans of the game, mecha robots, and sci-fi art would be delighted with The Art of Titanfall. 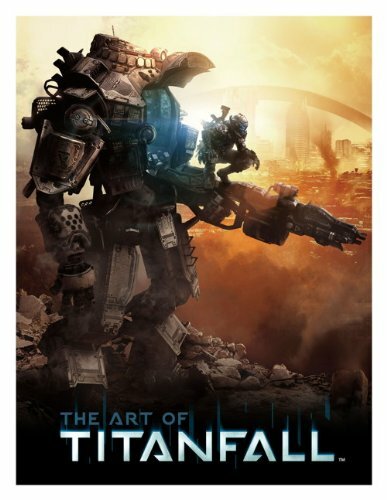 Game developer Respawn Entertainment has filled all the 192 pages of this hardcover with wonderful concept art. The artworks are a mixture, about half each, of in-game 3D models and digital art. And about half the book covers the mechas, characters, weapons, spaceships and vehicles. The latter half, about 100 pages, covers the environment art. Even though the book features 3D models as art from the game, these models are rendered really well with high resolution textures, good lighting and most importantly high poly-count models. They look great. You can still tell that they are texture-mapped, but they are not jarring or distracting. Designs are fantastic. The artworks are printed huge so most of the minute details are even visible. The mechas and spaceships look really cool. Last few pages shows some actual maquettes (small) and a full-size Titan in some workshop. There are a lot of environment art included, such as Demeter's futuristic cityscapes, devastated landscape of Fracture, exotic planets with leviathan bones everywhere, laid back tropical lagoon, and more. Again, lots of wonderful designs. As mentioned earlier, there are also 3D game graphics used here, and they do feel lacking in charm as compared to paintings. Nevertheless, all art pieces are good looking, just different in style. The Art of Titanfall is a great video game art book companion.